Red Oak Unfinished Retro Stair Tread 48" wide for overlaying an existing staircase with a wall on both sides (closed staircase). This is a stocked item and ships in 2-3 days! Our Retro Treads are 11 1/2" wide and 3/4" thick behind the bullnose and are specifically designed to be installed over an existing staircase. Unfinished Red Oak retro treads are delivered sanded and ready for application of stain and finish. Unlike 1" thick traditional treads retro treads are 3/4quot; thick and are designed to reface a stair rather than replace the entire stair. Using retro treads and retro risers will allow you to simply install over the top of your existing staircase. Solid retro stair treads are 3/4" thick with a full 1" bullnose and 11 1/2" deep. The "closed" style means that this tread has no mitered returns. Sometimes this is also referred to as a box tread. 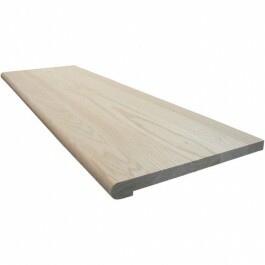 Our solid stair treads are guaranteed to never separate between the wood staves offering a lifetime of usage. In order to install retro treads on your stair case simply cut away the existing bullnose from each stair leaving a flush surface to work with. Our retro treads have a 1" bullnose along the front edge which is meant to hang over the existing step. Retro risers are designed to fit under the retro tread's bullnose to ensure a polished and finished look. For more information on the installation process check out our installation video for a step by step guide to installing retro treads and retro risers. My exising treads are 42-1/2" wide. Do I need to purchase a 48" tread or are the 42" treads available overcut? Yes - you'll definitely want to order the next size up. These treads are guaranteed to be at least 42" long but we do not guarantee that they will be any longer. The additional length of a 48" tread will give you some extra room to cut the toe-in or toe-out angles of your skirtboards during installation as well. We sell our products in 6" increments. If you need 46" i suggest our 48" tread which will need to be cut to size.